Right on the Wikipedia page for “People Who Don’t Like Casinos” is a picture of my face. Really, they are simply not my thing. One time, I played nickel slots in Atlantic City….hadn’t won anything after I put in 25 cents, so I stood up and declared that I was done. It was too painful and stupid to keep putting money in a box for no apparent reason. 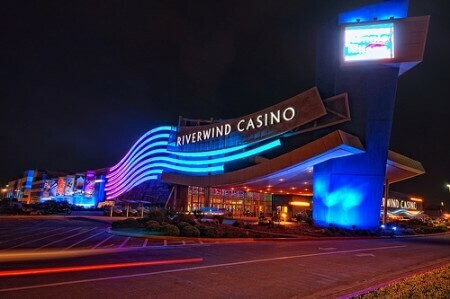 Riverwind is one of the many Chickasaw Nation casinos and gaming centers. Thanks to a wreck on the Interstate right by the casino entrance, however, I was trapped and couldn’t investigate anywhere else, so I wormed my way out of traffic, parked and walked in to see about a room. The casino is slightly separated from the hotel building, and while you do have to go through there to get to the restaurants, it’s no smokier or noisier than any other casino. The hotel, on the other hand, was quiet and felt rather plush, the staff was very friendly and efficient, and the room was a lot more upscale than I’d expected. That bed? I could hardly haul myself out of that bed the next morning. Com-FY. Free parking, a voucher for free breakfast, juice/coffee/tea always available in the lobby (plus fresh cookies!) and yes, free and fast WiFi in a room full of plugs to charge my blogging gear. I’d stay there again in a minute, and will quit turning up my nose at casino hotels. The bill came to about US$100 – not far out of line for midlevel chain lodging along that part of the Interstate in Oklahoma. Are there any casino hotels that you would recommend? Please let us know down in the comments. Now you know why Mr. Bruce and I stay as often as possible in a casino hotel. Yes, he loves the casino part, I like it. I know of several wonderful ones, a few duds, couple of bad ones. I found that interesting about the Free WIFI. I have had to pay for internet, however usually have no need for laptop. Last time I paid was in Tunica, Harrahs I think. Hope they now have free and fast. We are going to be staying at Ameristar in KC next week. Ameristar in St. Louis is wonderful too. Thanks for your insights, MissDazey!